Huawei launched Honor 8X smartphone in September this year. The device is the successor of the Honor 7X and comes with a huge 6.5-inch Full HD+ notched display with a resolution of 1080×2340 pixels. In this post, we will talk about the Honor 8X stock wallpapers and how to download it. The Honor 8X is powered by 2.2GHz octa-core Kirin 710 SoC coupled with 4GB/6GB of RAM and 64GB/128GB internal storage variant. The handset features a dual 20MP+2MP AI rear camera with LED flash and a single 16MP AI selfie camera. The front camera features pro modes, beautification mode, AI Face Unlock etc. The device packs a decent 3,750mAh battery running on Android Oreo over EMUI 8.2 skin out of the box. 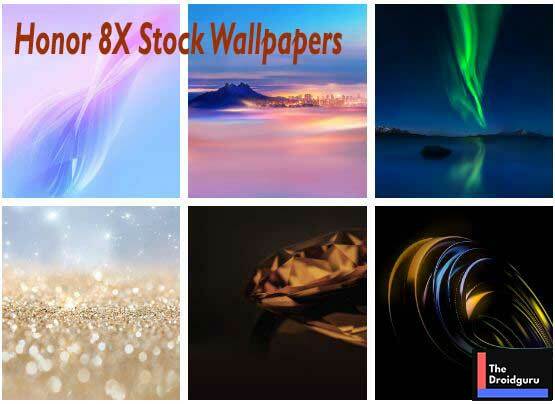 Here you can download all the 7 beautiful Full HD+ resolution Honor 8X stock wallpapers for free. The Huawei Honor 8X smartphone comes with the total 14 preloaded stock wallpapers but there are only 7 stock wallpapers are available externally for download. All the 18:9 or higher ratio display devices will look good with these wallpapers. Just download it and extract the zip file. Then simply choose one of the wallpapers and apply on the home screen or lock screen.